In our sixth summer as an Arts Partner in Chicago Parks, Midsommer Flight presented Shakespeare’s most famous tragedy. The production reached over 1,400 audience members over eight weeks of performances. Hamlet tells the story of the young Prince of Denmark, whose uncle has murdered his father and married his mother, thus usurping the throne. As Hamlet grapples with avenging his father’s death, the world around him begins to unravel: his relationships with his mother, his girlfriend, and his friends – and possibly his own sanity – which leads to an explosive and tragic conclusion. At its heart, Hamlet is a tale about a young man coming to terms with adulthood and the harsh realities of life. It is funny, sad, thought provoking, and arguably the most important and beloved piece of Western Literature to date. Midsommer Flight is a proud Arts Partner with the Chicago Park District. Hamlet was presented as part of the City of Chicago’s Night Out in the Parks initiative. The show’s original music, composed by Elizabeth Rentfro and Erick Rivera, is available on iTunes, Amazon, Google Play, Spotify, and more. 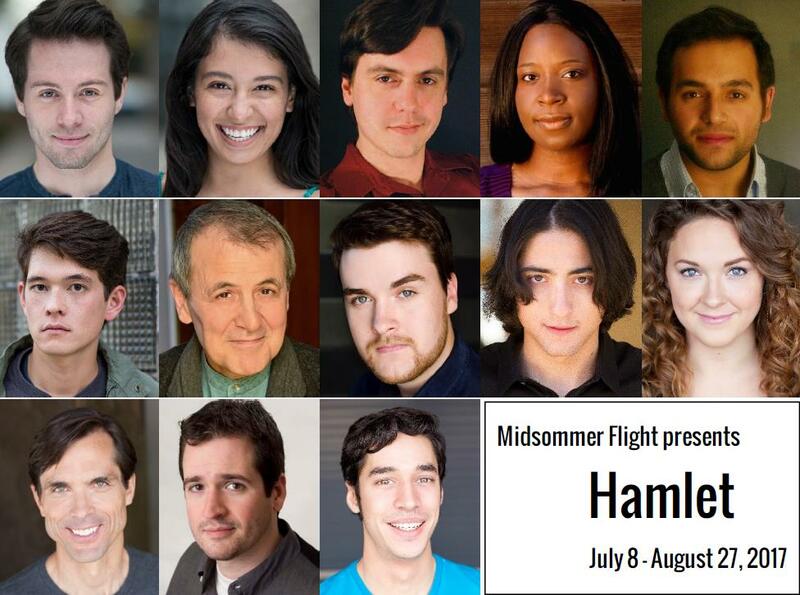 Cast: Samual Cheeseman (Hamlet), Jared Dennis (Claudius), Stephen Fedo (Polonius), Morayo Orija (Gertrude), Bianca Phipps (Ophelia), Joe Sergio (Laertes), Ian Michael Minh (Horatio), Mark Huddle (Ghost/Player King), Adam Habben (Marcellus/Osric/Lucianus/ Gravedigger 2), Jesse Montoya (Rosencrantz), Adam Rice (Guildenstern), Emily Renee Shimskey (Barnardo/Sailor/Ambassador/ Player Queen/Gravedigger1) and Erick Rivera (Musician/Composer). Production Staff: Beth Wolf (Director), Robin Waisanen (Stage Manager), Elizabeth Rentfro (Music Director / Vocal Coach), Jeremiah Barr (Scenic Designer), Meredith Ernst (Assistant Director), Chris Smith and Maureen Yasko (Fight Directors). This project was partially supported by a CityArts grant from the City of Chicago Department of Cultural Affairs and Special Events, a grant from the Illinois Arts Council Agency, and by The MacArthur Funds for Arts and Culture at The Richard H. Driehaus Foundation.